The coast cannot be left to nature to determine its fate. Wealth, property, economic interests, recreation, tourism and wildlife are all threatened. 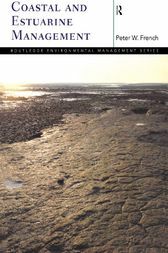 Coasts are an administrative battle ground and one of the most important and widely examined topics in environmental management. Coastal and Estuarine Management examines the issues surrounding the human use and abuse of estuarine and coastal environments. Emphasising the importance and significance of this natural resource, the uses and conflicts which occur and the results of human activity, this book explains the ways in which conservation and management policies and practices can protect this productive and diverse ecosystem. Examples and real-life case studies illustrate the effect of human intervention, both from an historic and contemporary perspective. Exposing the environmental consequences of estuarine pollution, Peter French highlights the need for management strategies to promote a sustainable development ethic for estuaries.